One of the moments in college—when I was pulled out of my immature way of viewing the world—was when I had to accept the fact that we will never have world peace. Let that sink in. As Catholics, we believe it is because we are all sinful. I believe anyone can look at how many people are in the world and see that getting all 7.5 billion to agree on something is a nearly impossible feat. I mean eventually Jesus will come and he will save the world and bring about world peace but what do we do until then? It has been 2000 years so I’m not counting on that being tomorrow. So, what do we do? We try anyway. Most people can look back on their life and point to a specific time when their life was changed. In most of these cases, you can find a person who was central to that change. Most teachers can point to a teacher that inspired them, most Christian Brothers that I have met chose to become a Brother because of the influence of one on their life. One of the easiest examples is marriage, their lives were forever changed because of the other. Relationships are powerful. I believe they are super powerful, and we all have this superpower. I have learned this since becoming a Lasallian Volunteer. A day at my position at LaSalle School consists of sitting in the lunchroom for an hour, getting a game ready, playing the game, playing another game in the evening, taking students to church, and going to do off-campus activities with them. That is what it looks like I am doing. From the moment I step out my door and walk across the parking lot, I am constantly growing and creating relationships with each one of my students. These students have been broken by relationships. People close to them have torn them down and not cared for them the way they needed and deserved. So, my job, as my professor in college told me, is to get to know them. Another thing I have learned since being at LaSalle School, is how delicate these students lives are. If one student who suffers from depression is not given the relationship he needs, he may end his own life. If another student who is emotionally and cognitively delayed is not given the relationship they need, then when they leave our school they may become homeless and never meet another person who cares about them. 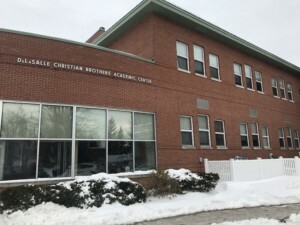 If a student who sexually acts out because he was sexually abused does not get the relationship he needs, when he leaves LaSalle he may end up harming another person’s life and his own. We have the power to affect change in these person’s lives. As the quote above states, when we reach out to another person, the world changes. It may not seem like it but if you have ever had the privilege of being that person for someone, then you may at least see that person’s world change. The reality is most of the time we will not see the fruits of our labors, we will not see how our relationship affected them, but we try anyway. We have the power to affect the world. The best part is we do not have to be MLK or Gandhi or Nelson Mandela to do it. We just have to be a brother or sister to those around us, to give people the time of day, and if we do that we will change the world. We are superheroes, all of us have the ability to be super. All it takes is a little time and a lot of relationship. Chris Lackey is a first-year volunteer serving at LaSalle School in Albany, NY. He is a graduate of Saint Mary’s University of Minnesota.